One of the most stress parts of starting a diet is completely figuring out what foods are on/off limits. When it comes to a low-carb, ketogenic approach, high-quality fats are stressed and sugar should be non-existent. Fast forward to the grocery store. You decide to accompany your (bun-less) bacon cheeseburger with a simple salad and your favorite Italian dressing. You get home, unpack everything and start to make dinner. You’re about to dress your salad when you suddenly notice the ingredients that are listed in the salad dressing. Soybean oil. Sugar. Gluten-based thickeners. Really? For a salad?! I know it seems like a small issue, but it is one that used to strike me all the time. It honestly sickens me that so many companies can put out products that aren’t sweet, yet laced with sugar and other monstrous additives. At any rate, I knew I had some recipe testing to do. 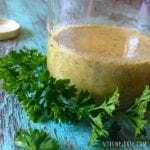 I had to create a salad dressing that tasted good and would be suitable for my low-carb, high-fat journey. I knew that a creamy Italian dressing would be perfect. In my recipe, I use a combination of avocado and extra virgin olive oil. This dressing can be made with one of these, but I really enjoy the flavors that the two create when combined. If you do tolerate dairy pretty well, add some grated parmesan cheese to the dressing! It’s sooo delicious! For a quick dinner, keep the spice blend mixed together without the liquid and use it to season your favorite meats or whip up a fresh batch of dressing when you need to. I personally love to dip raw veggies into it, like cucumbers and carrots. The possibilities are endless! Combine all dry ingredients and mix until evenly distributed. In a separate bowl, combine olive oil, olive oil and dijon mustard. Store covered in refrigerator for up to one week. What’s your favorite salad dressing? Comment below!